Fantastic piece of research by Andy Arthur and published by Bella Caledonia, but it does make for very depressing reading. 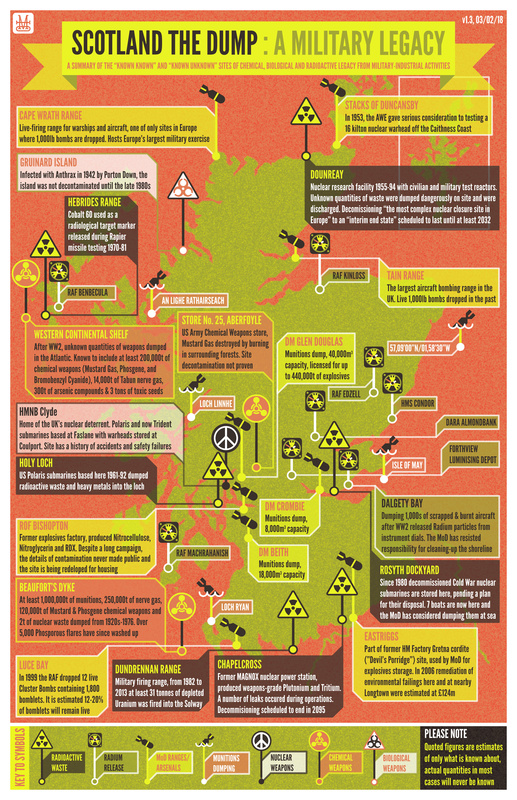 The map, shown above, indicates all the locations where military munitions and atomic waste have been dumped in Scotland. Something to be filed away and used for campaigning in the future (or perhaps now). A higher resolution version of the map is available at this link. The Bella article notes "some rights reserved" but doesn't elaborate any further. You might want to contact Andy directly if you wanted to make use of the map for something other than personal use. Posted by: Editor in Defence, Environment Feb. 24, 2018, 4:57 p.m. It would be most interesting to overlay this Map/Scotland the Dump with a Map of Cancer cases throughout Scotland. As many of us are aware, while cancer can be diagnosed much more effectively nowadays, is there a family in our country withOUT this devastating illness? As important as CURES are CAUSES. I seem to remember there was an article which correlated munitions dumps/nuclear sites with cancer clusters. I'll see if I can track it down.